Regional Manager for East Coast and East Malaysia Phang Yee Fong (4th from left) and Managing Director of Scania Southeast Asia Marie Sjödin Enström (5th from left), with the Scania sales and services team from the Sandakan workshop. 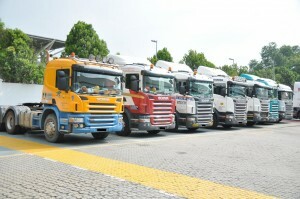 Scania has reinforced its position in East Malaysia with the recent launch of a new workshop in Sandakan, Sabah. This workshop will service customers in the Sandakan, Lahad Datu and Tawau areas, and adds to an already wide service network in Malaysia that provides the best services for safety, fuel economy, uptime and environmentally friendly solutions for truck, bus and coach operations. Scania’s presence in Sandakan will increase the convenience for its customers to enjoy all of the benefits Scania has to offer. Established with an investment of over RM500,000, this workshop is equipped with two work bays and manned by three skilled technicians who can work on up to four vehicles a day. Scania can increase number of technicians based on demand in order to support its customers. Like all Scania employees, the technicians will receive continuous formal training as well as undergo on-the-job training to enhance their skills, knowledge, professionalism and teamwork to ensure that they deliver a more effective service to their customers. In addition, Scania customers in Sandakan can continue to enjoy profitability in their operations through Scania’s sustainable transport solutions. Maintenance Services, Repair Services, Parts Services, Driver Services (consisting of Driver Training & Coaching), Fleet Management System (FMS), Financial Services, 24/7 Scania Assistance roadside services (call 1800-08-8500) are available to its customers. “We have been in Sabah for a long time and we continue to see potential growth in the state, especially in the east coast of Sabah. Our strategic presence in Sandakan complements the Kota Kinabalu facility in order to support our customers in achieving profitability and sustainability,” said Scania Southeast Asia Managing Director, Marie Sjödin Enström. “For customers to get the most out of their fleet, it is vital that Scania can support them with the right solutions. Convenient access to workshops and genuine parts is crucial for our customers anywhere. Our parts add value to their business because they are engineered for ultimate performance, endurance, fuel economy and safety, as well as lower environmental impact,” added Marie. The workshop will also make it easier for the customers in Sabah to adopt the Scania Ecolution programme, which is a partnership-based solution for operators and businesses to reduce fuel consumption and CO2 emissions. Operators will see their total operating economy improve while building a sustainability image that their customers can be proud of. In conjunction with the opening, Scania will be running a Recon Truck Promotion until the 31 March 2019. Owners of reconditioned Scania trucks can get a free health check and a free Scania retrofit of FMS or free activation of FMS. Scania also offers S service packages at 30 percent discount together with software checking and downgrading. 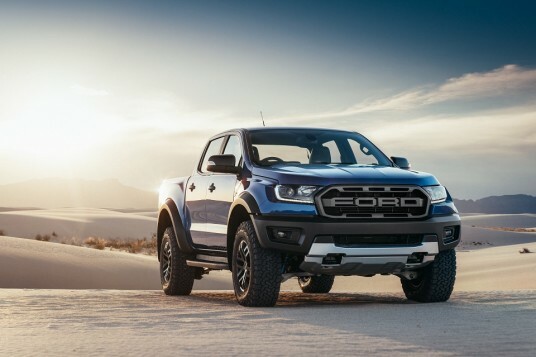 Maintenance contracts are also being offered at a special price of RM0.098/km with a minimum term of 10,000 km per month during the Recon Truck Promotion period. Checking for the correct filters for B10 diesel compatibility is also part of this great promotion, which is a step towards an environmentally-friendly state. 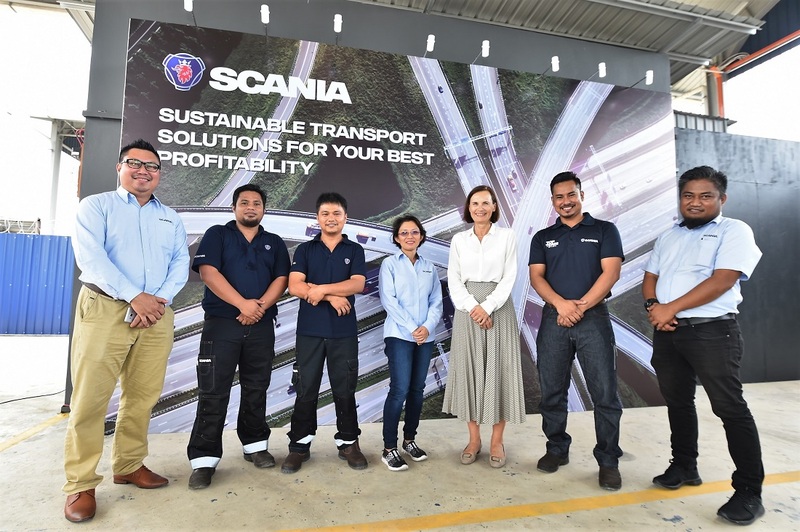 “Scania Malaysia in Sandakan together with our entire network of service centres will facilitate the shift towards a sustainable transport system for transport companies in this region. More needs to be done to lower emissions globally to reduce global warming and address climate change. We will continue to provide solutions to help our customers achieve the best profitability without sacrificing sustainability,” Marie added.